Why have one frequent flyer scheme... when you can have two! 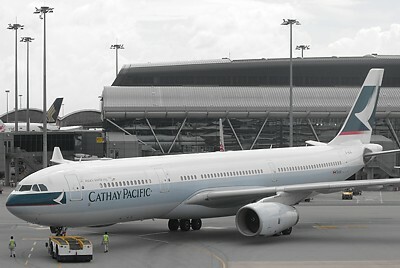 Cathay Pacific are unusual in having two totally separate programmes: the Marco Polo Club and Asia Miles respectively. Cathay Pacific's Frequent Flyer Program is called Asia Miles, and it is is a loyalty card for earning miles, which you can use for free flights. The Marco Polo Club is an elite loyalty programme, to gain status which gives you admission to lounges and other perks. This is currently part of the OneWorld Alliance. Cathay Pacific has a fairly standard mileage system for their Frequent Flier scheme. Almost all tickets earn both Club Miles and Club Sectors. You earn one Club Mile per mile you fly (plus a 125% or 150% bonus in Business or First Class respectively). Separate to this you have Club Sectors which are earned per sector flown, which again get a bonus according to the cabin class (1.25 sectors in Business and 1.5 for First Class). You move up the tiers from Base to Silver and Gold by either Club Miles or Club Sectors but not both. You cannot go directly from Green to Diamond status: you need to move up each tier at a time, whereupon your total goes down to zero, and you start a new year. If this sounds harsh, it is, and furthermore Cathay Pacific don't do soft landings: if you are already a Diamond member, but don't fly in a year, you'll be firmly bumped down to Green (although occasionally Cathay Pacific do make some exceptions if you are near your total, however this can't be relied upon, and infact is fairly rare). There are about three and a half million Asia Miles members, but only 500,000 Marco Polo members. Why? Because Marco Polo costs, and unless you fly frequently, you won't get any benefits. It costs US$50 to join, and you need to fly 4 Club sectors within a membership year for renewal, or you'll be kicked out. Cathay Pacific Asia Miles do not expire, however if you don't fly and post miles with a three year period, your account will be closed. First Class fares (A, F) earn 150% miles, Business Class fares (I, D, C, J) earn 125% miles, and Economy Class fares K, H, B, Y, V, L, M earn 100% miles. Be warned that economy class fare codes G, Q, N, O & S do not earn miles (However you'll get miles on BA's Executive Club, but only at a miserly 25%, on N, O, and Q). This is the basic mileage earning level. You can earn miles, but that's about it, other than being able to access to the Marco Polo homepage on the Cathay Pacific website and use priority check-in at designated Club counters (but not at the Business Class counter) where available. Silver is equivalent to oneWorld Ruby Status. It can be achieved at 30,000 miles or 20 Club sectors over your one year period. You get to check in at the business class check in desks and use Cathay Pacific and Dragonair Business Class lounges, when you are travelling on Cathay Pacific (but you cannot invite a companion), plus an extra 10kg of baggage allowance. Gold is equivalent to oneWorld Sapphire Status. It can be achieved at 60,000 miles or 40 Club sectors over your one year period, once you have reached Silver. You get to check in at the business class check in desks, and you also get lounge access on all economy tickets, not just on Cathay Pacific, but throughout the oneWorld network, and you can invite a companion. You get an extra luggage allowance of 15kg. Diamond is equivalent to oneWorld Emerald Status. It can be achieved at a whopping 120,000 miles or 80 Club sectors over your one year period, once you have reached Gold. You get to check in at the business class check in desks, and you also get First Class lounge access on all economy tickets, not just on Cathay Pacific, but throughout the oneWorld network, and you can invite a companion. You get an extra luggage allowance of 20kg. You are also guaranteed an Economy or Business Class seat 24 hours prior to departure.